With the world not that interested in the advancement in the hardware and physical side of the new iPhone, after rumors and reports that it won't be all that different from the current iPhone 6S, there isn't much to drive the hype of the new iPhone to a new level... until now. 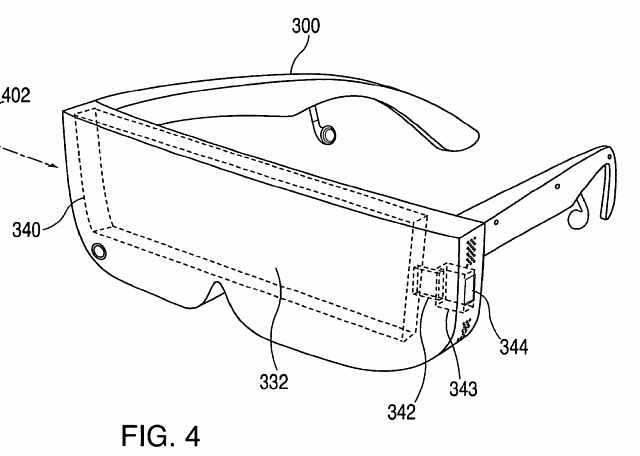 Today, Apple was awarded with a patent for what will eventually be a wireless VR headset for the iPhone, with a patent for a "Head-Mounted Display Apparatus For Retaining A Portable Electronic Device With Display". You can read up on Apple's patent on the United States Patent and Trademark Office website. 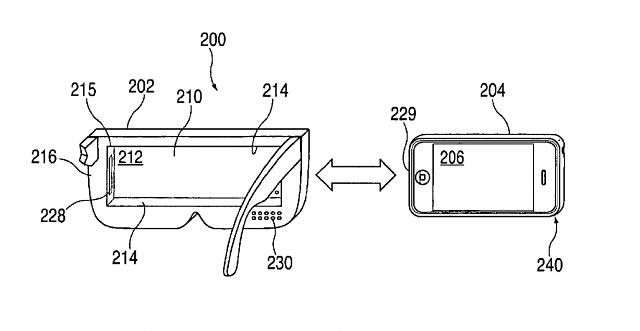 The patent itself has Apple teasing a potential head-mounted display that has the ability to "couple" itself with an iPhone, where you'll see images and video displayed using the screen on the iPhone. The headset will include built-in headphones, a Lighting connector that will connect the devices, an eyeglasses-like form factor, and custom lenses. As UploadVR reports: "Apple's outlined invention here has several similarities to the Samsung Gear VR that are immediately recognizable. Both of these devices differentiate themselves from other mobile HMDs such as Google Cardboard, or a variety of overseas knock-offs, through the physical connectors that allow the phone and device to be linked directly. According to the language in the specifications section of the patent, this coupling ability is the primary IP that Apple is interested in protecting with this patent". I originally saw this article on my personal Facebook feed, on Robert Scoble's Facebook post, who said we could see the VR headset revealed alongside the new iPhone, on September 7. This is just days away, and while Robert says he doesn't think Apple will do it, they could, he teases - and I agree. Apple could surprise us all, and unveil something truly magical and revolutionary, and blow us all away. This is huge. Will we see this on September 7th? I expect not until next year but I won't be shocked to have a "one more thing" announcement. 1. Screen resolution isn't good enough. You need a 4K screen. Current iPhone screens are 1K. Associated problem is refresh rate. Latency on screens must also speed up to give best results. 2. GPUs are too underpowered and phones can't deal properly with the heat generated by same. My Samsung shuts off after 40 minutes of play. 3. No six-degrees of freedom. New sensors, like Google's Tango are needed. Apple bought Primesense for exactly that reason. 4. Hand controllers needed. With Oculus and HTC Vive you can throw, slice, shoot, pick things up. Not so on Gear VR. Right now I am sitting at Huawei's large developer conference (It is the third largest mobile phone manufacturer, behind Apple and Samsung). They have all these problems plus it doesn't have the advantages of Apple. 1. Apple has distribution thanks to its network of stores. With VR you need to try it. Only Apple can do that. 2. Apple has a brand most people would be proud to have on their faces. Huawei isn't a brand most of my friends know and like. 3. Economic and relationship ties to content manufacturers. Content sells these things. 4. Huawei is mostly a monoculture internally. I don't see many Westerners involved in leadership there. Apple's leadership is far more diverse (and I am not talking about women vs men). Culture is driven by having people from around the world and different cultural backgrounds involved. Silicon Valley is way ahead here. Apple is poised to be a giant here. I'd wish Apple made a move to VR world but, unfortunately, I'm very skeptical right now. One of the things with Apple (for me) is that they try to do something "fancy" so, maybe they are already working on it but if it's bulky, heavy or something like that, they won't release it to public in the near future, but I can believe they should be working in something right now, nobody though Microsoft was working in AR/MR before of the announcement and they so far have one of the most interesting projects in that field with the hololens.